Soils (and vegetation + ecosystems) form under complex interactions between climate, living organism and anthropogenic influences, modified by relief and hydrological processes and operating over long periods of time. This has been clearly identified first by Jenny (1994) with his CLORPT factors of soil formation and subsequently extended by McBratney, Mendonça Santos, and Minasny (2003) with the SCORPAN formulation (see section 1.3.3). In the following sections we provide some practical advice (with links to the most important data sources) on how to prepare soil covariates for use in PSM. Adding relevant covariates that can help explain the distribution of soil properties increases the accuracy of spatial predictions. Hence, prior to generating predictions of soil properties, it is a good idea to invest in preparing a list of Remote Sensing (RS), geomorphological/lithologic and DEM-based covariates that can potentially help explain the spatial distribution of soil properties and classes. 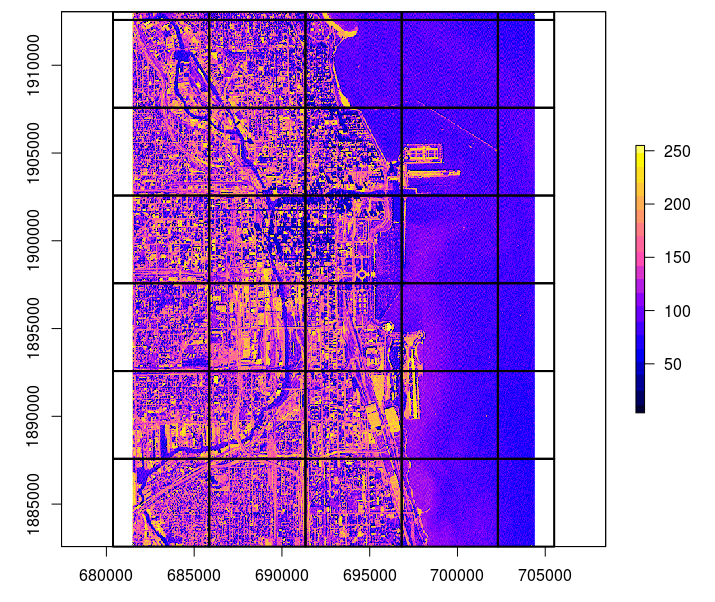 There are now many finer resolution (30–250 m) covariates with global coverage that are publicly available without restrictions. The spatial detail, accessibility and accuracy of RS-based products has been growing exponentially and there is no evidence that this trend is going to slow down in the coming decades (Herold et al. 2016). Note that the required download time for 30 m global RS data can be significant if the data are needed for a larger area (hence you might consider using some RS data processing hub such as Sentinel hub, Google Earth Engine and/or Amazon Web Services instead of trying to download large mosaics yourself). Hyperspectral imaging systems, similar to field-based soil spectroscopy, and the upcoming missions such as SHALOM (Italy and Israel), HypXIM (France) and HypsIRI (USA) will most likely revolutionaize use of remote sensing for soil mapping. Landform classes (breaks/foothills, flat plains, high mountains/deep canyons, hills, low hills, low mountains, smooth plains) based on the USGS’s Map of Global Ecological Land Units (Sayre et al. 2014). Average soil and sedimentary-deposit thickness in meters (Pelletier et al. 2016). The covariates above were selected to represent factors of soil formation according to Jenny (1994): climate, relief, living organisms, water dynamics and parent material. Of the five main factors, water dynamics and living organisms (especially vegetation dynamics) are not trivial to represent, as these operate over long periods of time and often exhibit chaotic behavior. Using reflectance bands such as the mid-infrared MODIS bands from a single day, would be of little use for soil mapping for areas with dynamic vegetation, i.e. with strong seasonal changes in vegetation cover. To account for seasonal fluctuation and for inter-annual variations in surface reflectance, long-term temporal signatures of the soil surface derived as monthly averages from long-term MODIS imagery (15 years of data) can be more effective to use (Hengl, Mendes de Jesus, et al. 2017). Long-term average seasonal signatures of surface reflectance or vegetation index provide a better indication of soil characteristics than only a single snapshot of surface reflectance. Computing temporal signatures of the land surface requires a considerable investment of time (comparable to the generation of climatic images vs temporary weather maps), but it is probably the best way to effectively represent the cumulative influence of living organisms on soil formation. Behrens et al. (2018) recently reported that, for example, DEM derivatives derived at coarser resolutions correlated better with some targeted soil properties than the same derivatives derived at finer resolutions. In this case, resolution (or scale) was represented through various DEM aggregation levels and filter sizes. Some physical and chemical processes of soil formation or vegetation distribution might not be effective or obvious at finer aggregation levels, but these can become very visible at coarser aggregation levels. In fact, it seems that spatial dependencies and interactions of the covariates can often be explained better simply by aggregating DEM and its derivatives (Behrens et al. 2018). The following examples should provide some ideas about how to program these steps using the most concise possible syntax running the fastest and most robust algorithms. Raster data can often be very large (e.g. 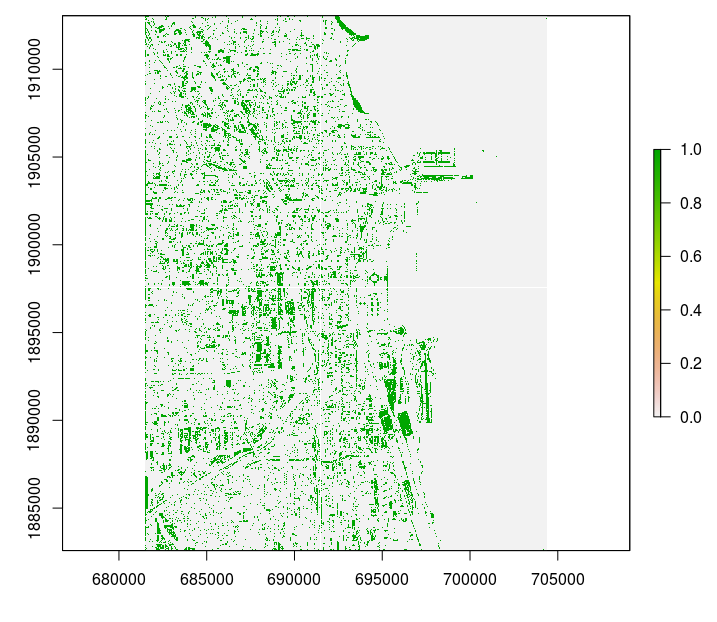 millions of pixels) so processing large stacks of remote sensing scenes in R needs to be planned carefully. The complete R tutorial can be downloaded from the github repository. Instructions on how to install and set-up all software used in this example can be found in the software installation chapter 2. Figure 4.1: Ebergotzen parent material polygon map with legend. The eberg_grids25 object is a SpatialPixelsDataFrame, which is a spatial gridded data structure of the sp package package. The raster package also offers data structures for spatial (gridded) data, and stores such data as RasterLayer class. Gridded data can be converted from class SpatialPixelsDataFrame to a Raster layer with the raster command. The CRS command of the sp package can be used to set a spatial projection. EPSG projection 31467 is the German coordinate system (each coordinate system has an associated EPSG number that can be obtained from http://spatialreference.org/). Figure 4.2: Ebergotzen parent material polygon map rasterized to 25 m spatial resolution. fasterize function is an order of magnitude faster and hence more suitable for operational work; it only works with Simple Feature (sf) objects, however, so the sp polygon object needs to be first coerced to an sf object. 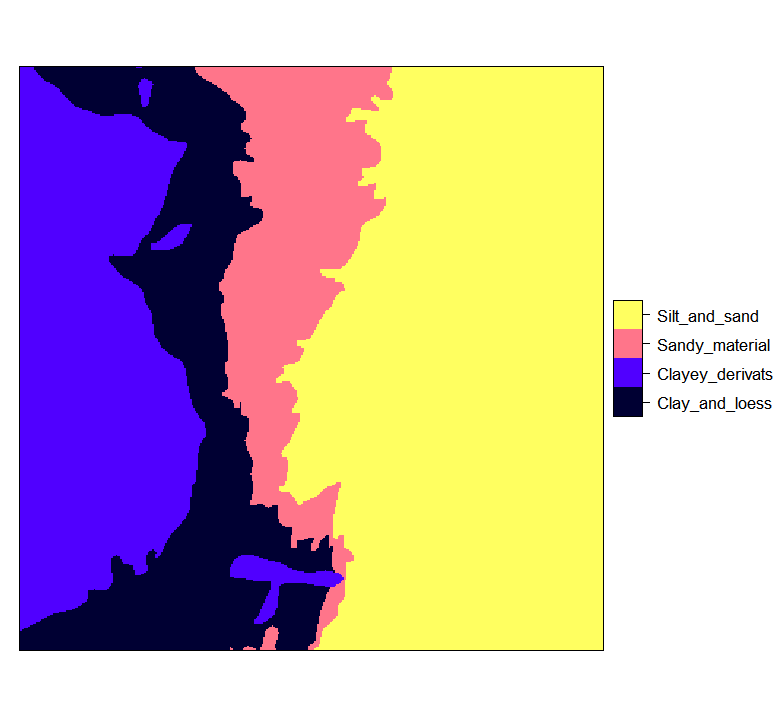 The writeOGR() command writes a SpatialPolygonsDataFrame (the data structure for polygon data in R) to an ESRI shapefile. Here we only write the attribute "ZONES_int" to the shapefile. 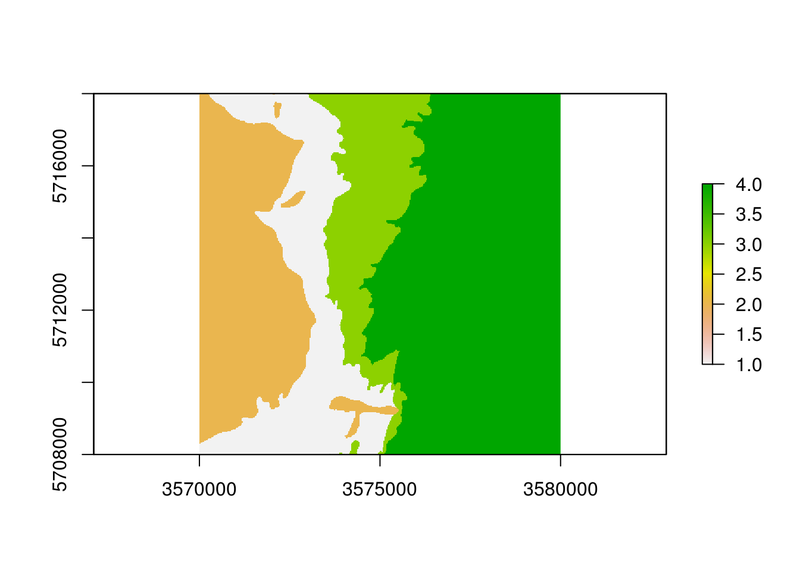 It is, however, also possible to write all attributes of the SpatialPolygonsDataFrame to a shapefile. With the system() command we can invoke an operating system (OS) command, here we use it to run the saga_cmd.exe file from R. The paste0 function is used to paste together a string that is passed to the system() command. The string starts with the OS command we would like to invoke (here saga_cmd.exe) followed by input required for the running the OS command. 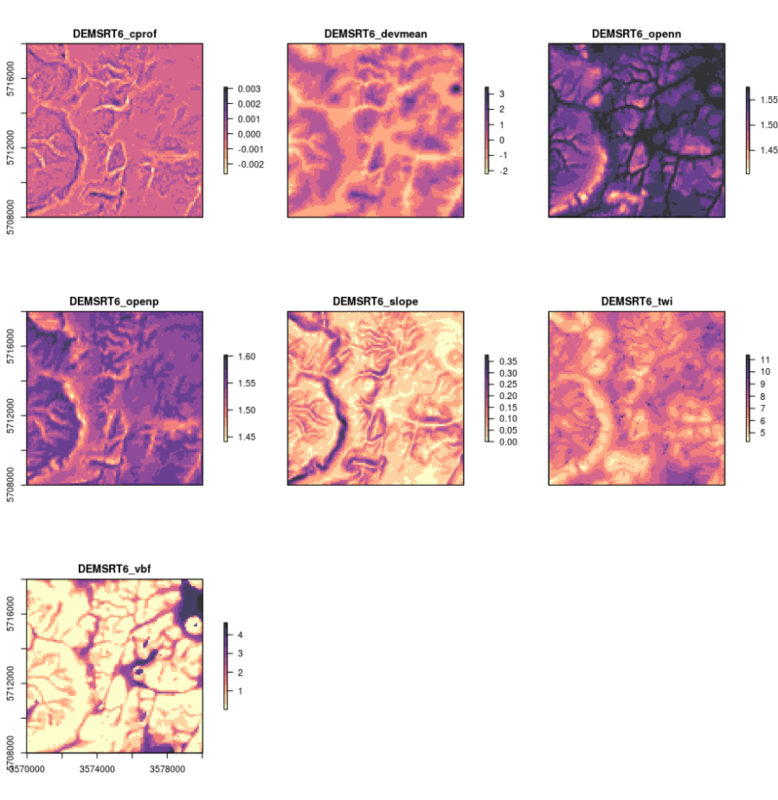 #>  "Clay_and_loess"  "Clayey_derivats" "Sandy_material"  "Silt_and_sand"
Figure 4.3: Ebergotzen zones rasterized to 25 m resolution and with correct factor labels. #>  "PRMGEO6" "DEMSRT6" "TWISRT6" "TIRAST6" "LNCCOR6"
#> Warning in system(paste0("gdalwarp extdata/eberg_grid_TWISRT6.tif", "
-te 3570000 5708000 3580000 5718000 -tr 25 25 -overwrite"
Figure 4.4: Original TWI vs downscaled map from 100 m to 25 m.
The map on the right looks much smoother of course (assuming that this variable varies continuously in space, this could very well be an accurate picture), but it is important to realize that downscaling can only be implemented up to certain target resolution i.e. only for certain features. For example, downscaling TWI from 100 to 25 m is not much of problem, but to go beyond 10 m would probably result in large differences from a TWI calculated at 10 m resolution (in other words: be careful with downscaling because it is often not trivial). 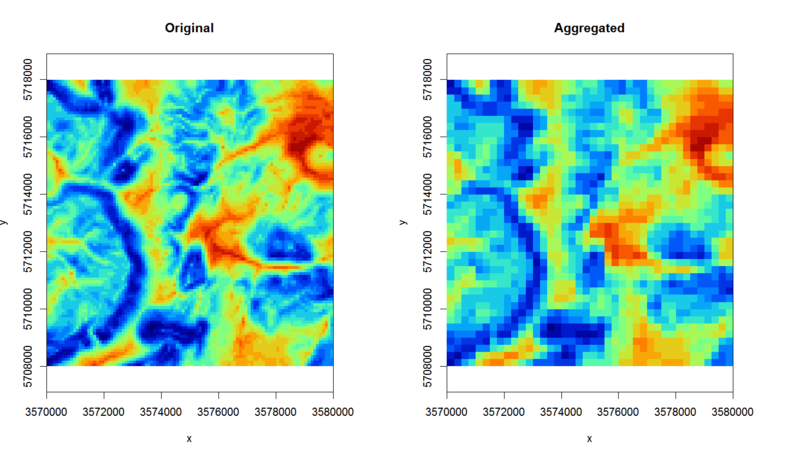 Figure 4.5: Original TWI vs aggregated map from 100 m to 250 m.
Figure 4.6: Some standard DEM derivatives calculated using SAGA GIS. This function can now be used with any DEM to derive a standard set of 7–8 DEM parameters consisting of slope and curvature, TWI and MrVBF, positive and negative openness, valley depth and deviation from mean value. You could easily add more parameters to this function and then test if some of the other DEM derivatives can help improve mapping soil properties and classes. Note that SAGA GIS will by default optimize computing of DEM derivatives by using most of the available cores to compute (parallelization is turned on automatically). In this example we use the same input and output file for filling in gaps. There are several other gap filling possibilities in SAGA GIS including Close Gaps with Spline, Close Gaps with Stepwise Resampling and Close One Cell Gaps. 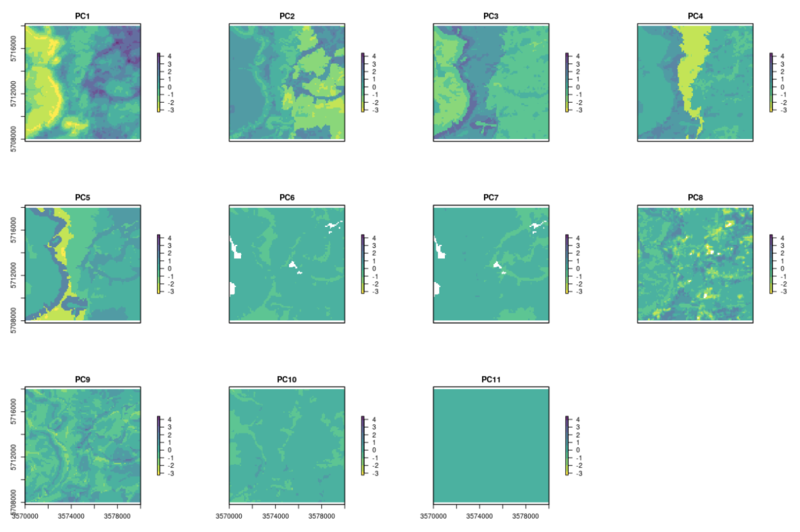 Not all of these are equally applicable to all missing pixel problems, but having <10% of missing pixels is often not much of a problem for soil mapping. Figure 4.7: 11 PCs derived using input Ebergotzen covariates. A disadvantage of using spc is that these components are often abstract so that interpretation of correlations can become difficult. Also, if one of the layers contains many factor levels, then the number of output covariates might explode, which becomes impractical as we should then have at least 10 observations per covariate to avoid overfitting. One could now save all the prepared covariates stored in SpatialGridDataFrame as an RDS data object for future use. In a similar way, one could also make wrapper functions that downscale/upscale grids, then filter missing values and stack all data together so that it becomes available in the working memory (sp grid or pixels object). Overlay and model fitting is also implemented directly in the GSIF package, so any attempt to fit models will automatically perform overlay. Figure 4.8: Example of a tiling system derived using the GSIF::getSpatialTiles function. 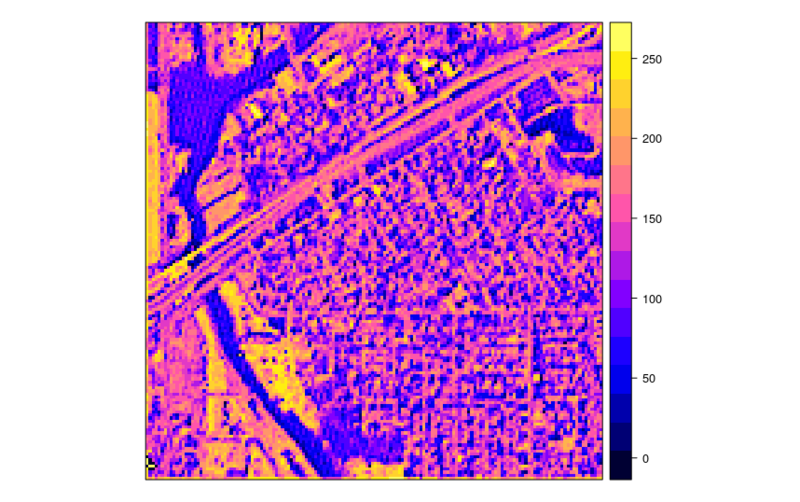 Figure 4.9: A tile produced from a satellite image in the example in the previous figure. Figure 4.10: Final processed output. This demonstrates that R can be used to compute with large rasters, provided that these operations can be parallelized. Suggested best practice for this is to: (1) design a tiling system that optimizes use of RAM and read/write speed of a disk, (2) prepare and test a function that can then be run in parallel, and (3) stitch back all tiles to create a single large raster using gdalwarp. Note that such tiling and stitching can not be applied universally to all problems e.g. functions that require global geographical search or all data in the raster. In such cases tiling should be applied with overlap (to minimize boundary effects) or to irregular tiling systems (e.g. per watershed). Once an optimal tiling system and function is prepared, R is no longer limited to running efficient computing, but only dependent on how much RAM and how many cores you have available i.e. it becomes more of a hardware than a software problem. 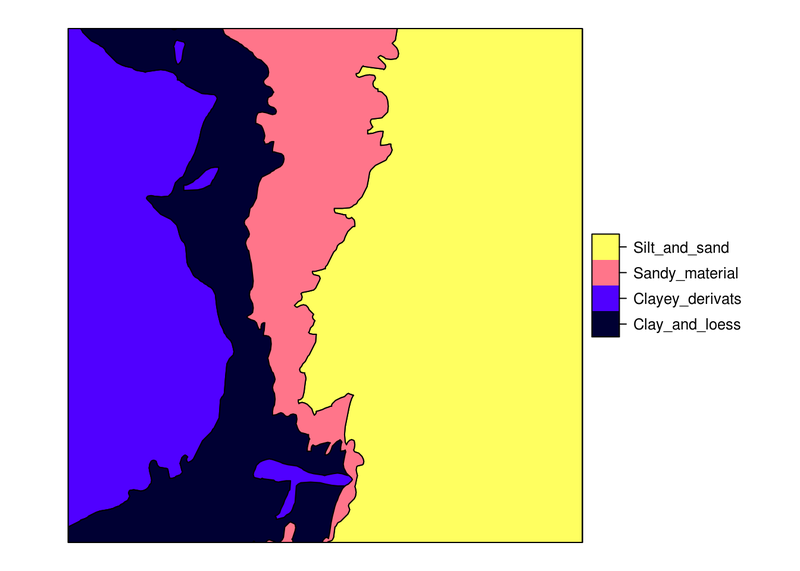 Soil covariate layers are one of the key inputs to predictive soil mapping. Before any spatial layer can be used for modeling, it typically needs to be preprocessed to remove artifacts, resample to a standard resolution, fill in any missing values etc. All these operations can be successfully run by combining R and Open Source GIS software and by careful programming and optimization. Preparing soil covariates can often be time and resources consuming so careful preparation and prioritization of processing is highly recommended. Hengl, Mendes de Jesus, et al. (2017) show that, for soil types and soil textures, DEM-parameters, i.e. soil forming factors of relief, especially flow-based DEM-indices, emerge as the second-most dominant covariates. These results largely correspond with conventional soil survey knowledge (surveyors have been using relief as a key guideline to delineate soil bodies for decades). Although lithology is often not in the list of the top 15 most important predictors for PSM projects, spatial patterns of lithologic classes can often be distinctly recognized in the output predictions. This is especially true for soil texture fractions and coarse fragments. In general, for predicting soil chemical properties, climatic variables (especially precipitation) and surface reflectance seem to be the most important, while for soil classes and soil physical properties it is a combination of relief, vegetation dynamics and parent material. Investing extra time in preparing a better map of soil parent material is hence often a good idea. Other potentially useful covariates for predicting soil properties and classes could be maps of paleo i.e. pre-historic climatic conditions of soil formation, e.g. glacial landscapes and processes, past climate conditions and similar. These could likely become significant predictors of many current soil characteristics. Information on pre-historic climatic conditions and land use is unfortunately often not available, especially not at detailed cartographic scales, although there are now several global products that represent, for example, dynamics of land use / changes of land cover (see e.g. HYDE data set (Klein Goldewijk et al. 2011)) through the past 1500+ years. As the spatial detail and completeness of such pre-historic maps increases, they will become potentially interesting covariates for global soil modeling. USA’s NASA and USGS, with its SRTM, MODIS, Landsat, ICESat and similar civil-applications missions will likely remain the main source of spatial covariate data to support global and local soil mapping initiatives.